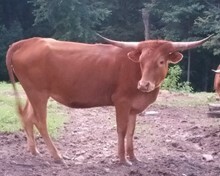 She is bred to Hubbell's Cowboy Van Horn for a 2019 calf. This beautiful big bodied gal has given a nice heifer that we are retaining . Now we are offering her to you to enjoy her beauty and easy going disposition.